I'm about to do my most favorite thing EVER in this blog post. Yeah, we're gonna talk ingredients. Absolutely there's a video in case you wanna hear me ramble on for about 14 minutes. But the highlight of this post? Putting you up on game. I love being able to share products that I feel are like, best kept secrets. That everybody and they momma should know about, but doesn't. And curLUXE Naturals fits that billing to a tee. 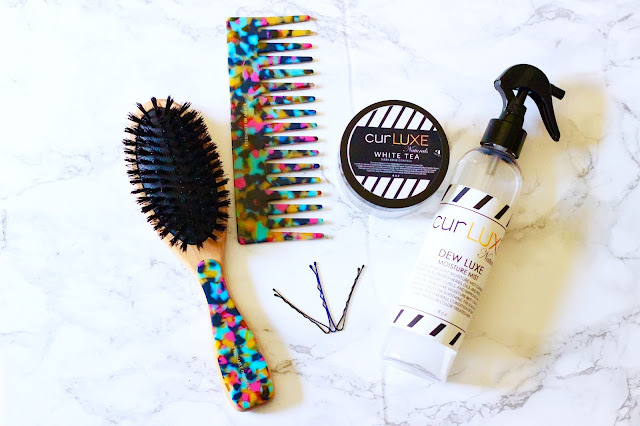 Because there's so much competition in the natural hair space (which is a beautiful thing for us on the consumer end, cause options), new and emerging brands have got to have more going for them than a miracle butter and crazy wild hair growth oil. No matter the size or scale of your brand, I want to see your passion and vision come through in what you bring to the table. 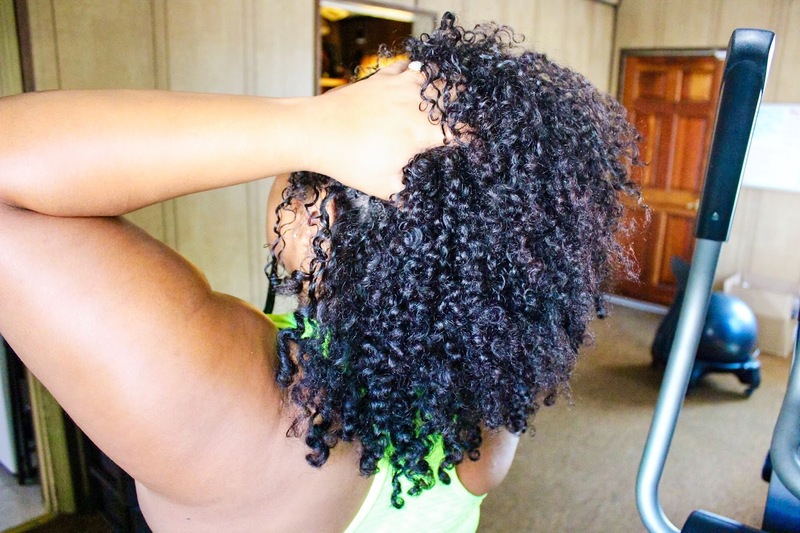 And curLUXE Naturals did that - in more ways than one. It's pretty fair to say I'm obsessed. 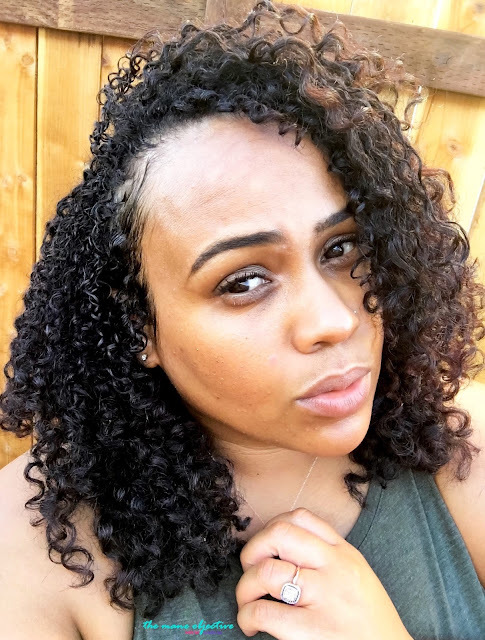 Let me break down why I'm riding with curlLUXE Naturals for the long haul. Chances are, by the end of this review you will be, too. Aloe Vera Leaf Juice: Acts as a natural conditioning agent that restores the hair's sheen, luster, and shine. It not only makes the hair soft, but it also enhances strength and suppleness. MSM: MSM is a naturally occurring sulfur found in many foods. Mainly known for joint health and inflammation, MSM has some promising effects on hair growth. Not only is sulfur a building block for your hair, it also has been shown to lengthen the growing phase of hair. Peppermint Leaf Extract: Stimulates follicles and promotes hair growth. Ummm, everything. No, but seriously. 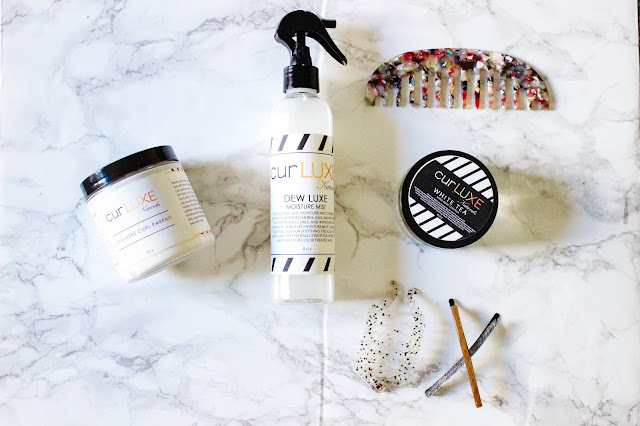 Dew Luxe was the first product of the four that I tried, and I knew from the second I slid the nozzle into "unlock", I was in for a treat. This ain't ya average refresher spray, by any stretch. Although it can be used as a hair and scalp refresher, I tend to use it almost exclusively as the later. Why? Two reasons. One, it's AMAZING on the scalp. And two, the other products from curLUXE Naturals are so moisturizing, you don't even need a hair refresher. Seriously. For me, Dew Luxe is a GAME CHANGER. Like, you know that cool tingly feeling you get on your scalp as you cleanse with Bae Clean, or deep condition with Mielle or Rapunzel? Imagine that, two days later when it's hot as satan's chambers outside. That's what Dew Luxe delivers. It's like a cool shot button for the scalp. If I were a protective styling type of gal, I would HAVE to have this in my arsenal for scalp maintenance. And the ingredient list that supports scalp and hair health is off the charts! Those active ingredients are just the tip of the iceberg. We're talking yucca, horsetail, bamboo, amla, biotin, and more. Seriously, there is no down side to Dew Luxe. Like, I tried hard to think about it - and curLUXE Naturals got it down - right down to the type of trigger spray nozzle (instead of that blasted other type that's a disaster for wet or oily hands). My re-up game with curLUXE Naturals in general is about to be SKRONG. Cashmere Curl Parfait and White Tea Edge Control workin' pre-cut. Glycine Soja Oil: Carrier oil used to lubricate and nourish the hair, providing softness and shine. Olive Fruit Oil: Olive Oil is rich in high levels of mono-unsaturated fatty acids and vitamin E. Vitamin E is an antioxidant, which is good for hair growth. Both mono-unsaturated fatty acids and vitamin E are good for moisturizing, protecting and nourishing hair. Olive oil makes hair grow stronger and its emollient properties prevent hair loss. Behentrimonium Methosufate: gentle surfactant made from non-GMO rapeseed (canola oil), and is one of the mildest detangling ingredients out there. It doesn't cause buildup or irritation to the scalp. Remember what I said a few minutes ago about moisture? Yep. 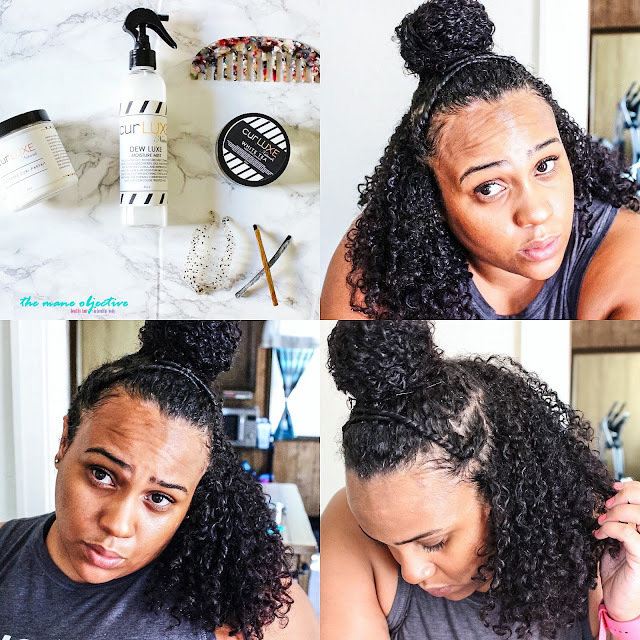 With curLUXE Naturals, it starts on wash day. Forreals. 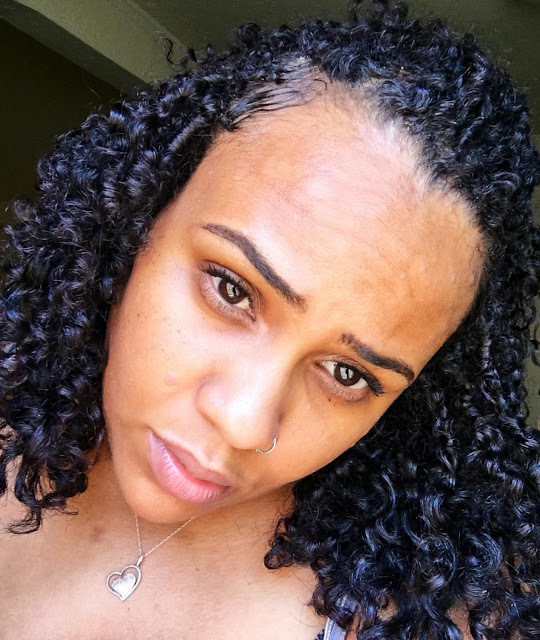 the Manuka Honey & Avocado Conditioning Nectar is a thick peice of magic goodness that intensely moisturizes my hair and makes it feel like BUTTAH! Which is crazy, because you only leave it in for 5 minutes. In the video, I called Manuka Honey & Avocado a "fast-acting deep conditioner" and I meant every word of it. For those of y'all wondering what that means, it means that the conditioner has the properties and performs like a deep conditioner, without having to spend an eternity with it in your hair. 5 minutes, and I'm out. What's even cooler about Manuka Honey & Avocado is that it can be used as a leave-in as well. But, with the next product I'm gonna discuss, you don't even need it. The only drawback for me which isn't even really a drawback, is the absence of protein. I'm a protein junkie when it comes to my hair. But considering the number of products I use that don't contain protein, I think having at least one that's purely moisturizing is beneficial. Crazy moisture. Like, off the charts. A must-have for chronically dry hair. To be honest, I'm on the fence with this one. It's a DOPE deep conditioner. But I luh protein. I don't know. It's amazing. But I kinda wanna just invest in a lifetime supply of Cashmere Curl Parfait, Dew Luxe, and White Tea Sleek Edge Control. Decisions, decisions. But I'm a product junkie, so yes. Cetearyl Alchol: Considered "fatty alcohol" -- NOT to be confused with drying alcohols such as ethyl. Acts as a lubricant, thickener, and emollient. Also gives conditioner its velvety feel without making hair greasy. Is additionally used to keep product ingredients from separating. Ignore the forehead. Peep the curls. Truth telling time - the first active ingredient listed here should be MAGIC. Y'all, I'm OBSESSED with this stuff. Like, it's a magical jar of moisturizing goodness. If there was a buttercream hall of fame, Cashmere Curl Parfait would be in it. If you watch the video, you'll see exactly what I mean. I've made a DEEEEEP dent in Cashmere Curl Parfait - a true testament to its power. It's thick. It's creamy. It INTENSELY moisturizes - for days on end. It produces amazing shine, and that touchable smoothness that makes you have serious hand-in-hair syndrome. If you get a chance to watch the video, you'll see me go on and on about Cashmere Curl Parfait. It's so good, that my friend +Antoinette Arrington wants to change her kid's name to Cashmere. Watch the video. I'm not kidding! The only downside to any product that steals my heart? The container is never big enough. I need an every-other-month mail order of Cashmere Curl Parfait, or something. I don't ever wanna be without it. It plays nicely with my favorite curl definers. It's so moisturizing, I don't need a leave-in or dual leave-in, or LOC, or LCO - none of that. Cashmere Curl Parfait + wet hair + Obia's Custard = a good hair day every single time. Y'all thought I was playing about a mail order supply, huh? Aqueous Botanical Infusion: Riboos, White Tea, Green Tea: Water infusion with these three teas provides a beneficial boost of natural antioxidants, proven DHT blockers (one of the main causes of hair loss), antibiotics, and stimulation of blood circulation to hair follicles, all which promote hair growth. Glyceryl Cocoate: Polymer derived from polyethylene glycol and coconut oil fatty acid, used as a conditioning agent, emulsifier, emollient, and surfactant. Hydrogenated Castor Oil: Polyethylene glycol derivatives of castor oil used to help form emulsions by reducing the surface tension of ingredients, also acts as a solvent to help ingredients mix that normally would not. Polyquaternium-7: Polymeric quaternary ammonium salt used as an antistatic agent and hair fixative (for hold). Broccoli Seed Oil: Oil extracted from the seeds of broccoli, rich in Vitamins A, C, B6 that promotes growth, slows hair loss (naturally contains a DHT blocker), and strengthens the follicles. Also contains a unique fatty acid composition that delivers intense shine, similar to that of a silicone - naturally. I think? Is edge control in general a CG thing? Lol. 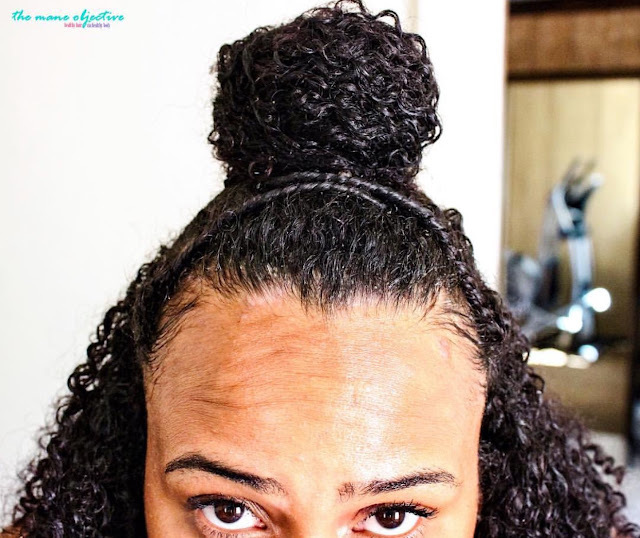 My favorite edge control used to be the Eden's BodyWorks Coconut Shea Control Edge glaze. But one thing I could never jive with was the white buildup after 2-3 days of continuous use. Thanks to White Tea Sleek Edge Control, I no longer have to worry about that. Not only do the ingredients make my heart (and my baby hairs) sing, but with this edge control I've got the perfect balance. Great shine, great hold - a very natural looking hold at that, and all without managing to look like Jermaine Jackson (watch the video at 11:23 for the visuals). What's even better is that I can literally use White Tea Sleek Edge Control every day - without white clumpy buildup. The only downside is that White Tea Sleek Edge Control is pricier than my former fave. Yes, edges! Flourishing and flat at the same time? My new go-to favorite edge control. As a matter of fact, yesterday I had a little sitch that I shared on Snapstagram and Snapchat (both maneobjective), where I tried to give myself two cornrows and it was a DISASTER. 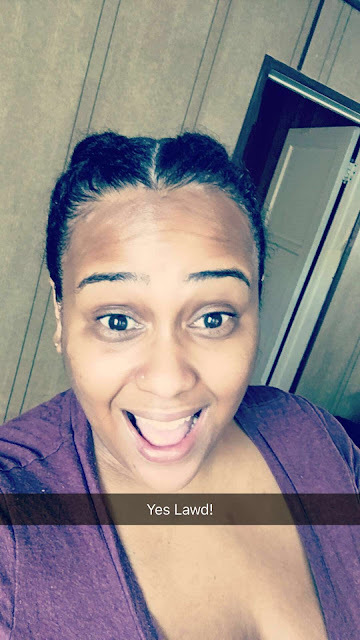 Luckily, Antoinette (yes, "Change My Kid's Name to Cashmere" Antoinette came through and blessed my tresses with two neat braids and baby hairs slicked. Tools used? Eternally in Amber rainbow comb, brush, and curLUXE Naturals White Tea Sleek Edge Control! And of course, I put Dew Luxe on my scalp. I was beyond thrilled about my hair. You can't buy these levels of enthusiasm. Well there you have it folks, curLUXE Naturals in the flesh! Will you be giving this line a try? Let me know in the comments below!